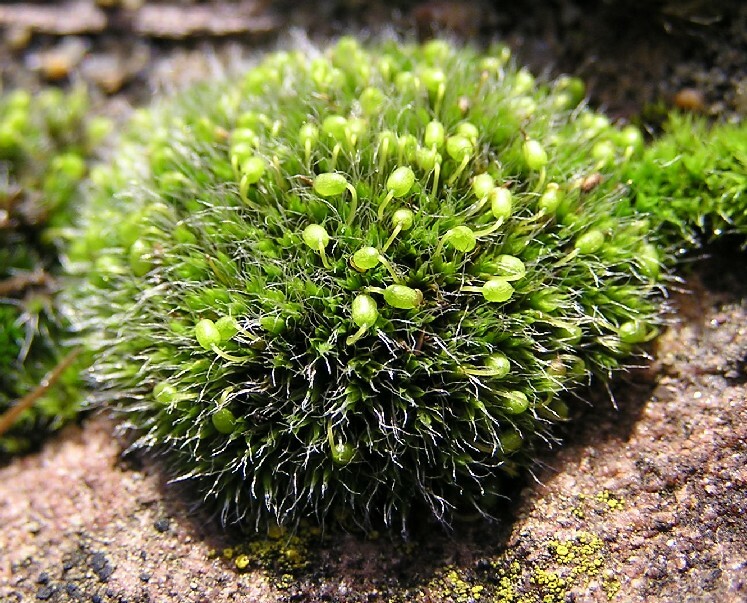 Grimmia pulvinata, copyright Michael Becker. Grimmia is a genus of mostly short-stemmed mosses found growing in close cushions or tufts on rocks (Dixon 1924). Characters (from Dixon 1924): Mostly short-stemmed, growing in close cushions or tufts on rocks; stems dichotomous. Leaves crowded, more or less lanceolate, usually hyaline-pointed, margin frequently thickened, almost always entire; areolation short and often opaque above. Seta arcuate or straight. Calyptra smooth; capsule oval. Peristome teeth 16, cleft at apex or entire, lanceolate.